USA - Prize fights require a massive level of bombastic pomp and circumstance to fill a large sports arena and, of course, lighting provides a major role in delivering that in-the-moment sensory experience. For the recent WBA welterweight and WBC super welterweight title fight between Floyd Mayweather and Marcos Maidana at the MGM Grand in Las Vegas, Frank Gatto & Associates of Boca Raton, Florida tapped an Avolites Sapphire Touch console. Somewhat upping the ante in terms of technical proficiency requirements, the bout was also being broadcast on Showtime PPV, notes Jason Eible, lighting director for Frank Gatto & Associates, which for 30 years has designed television and special event lighting for networks including HBO, ABC, ESPN, CBS, NBC, Fox, Showtime, Telemundo and Univision. "I wouldn't say that there are specific needs for lighting a prize fight, however, there are specific needs in lighting a live television sporting event," points out Eible, who has been working with FG&A since 1997. "You need to be able to quickly and efficiently edit cues and palettes on the fly. If, for instance, a camera needs to change position right before or during the show, you need to be able to quickly update cues and palettes, and Avo makes it really simple to do." 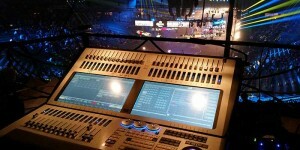 When deciding which console to use for an event, a few factors help Eible narrow down his choice. "For most shows I'm comfortable with any Avo product running Titan software," he notes. "For bigger events, such as the Mayweather-Maidana fight, having a Sapphire Touch gives me the ability to program and edit quickly because of its large workspace. When it comes to bigger shows, the Sapphire is the way to go." One of Eible's favorite features on Titan is the playback workspace window. "Our main event was on a Saturday, but we had a rap concert with a Latino R&B artist open Friday morning and the weigh-in show Friday afternoon. These events all lead up to the main event in the same arena. I was able to pre-program a lot of each show using Visualizer/Simulator on my laptop and then storing my cues on the playback workspace. Once I got to the show and opened up the Sapphire, I could easily lay out my shows on the faders using the playback window. After each show, I simply moved my cues back to that workspace and moved my new show onto my faders. Having the ability to simply play back cues in the workspace window from the touchscreen on the desk is also a great feature that I use all the time." Eible cautions: "The Sapphire is not your grandpa's desk. Titan's features and versatility offer the ability to work in any environment." Titan software's intuitiveness to work on any Avo product – especially the Sapphire Touch – make it Eible's "go-to console of choice." He notes that beam lights have certainly made an impact in recent years on live events such as boxing matches. "I love using them as often as I can. Avolites' free Titan remote software allows me to grab my tablet and head to the stage or camera position and focus my beams the way I like." On weigh-in day for the Mayweather-Maidana fight, the system deployed 18 additional beams, 48 LEDs and 48 conventionals added to 44 wash units and 124 conventionals for the main show, as well as a huge 40-foot-wide video wall. The MGM Grand in Las Vegas has in-house "a nice conventional lighting system to light the audience," comments Eible. The system is located in the catwalk, and FG&A uses it to accent crowd lighting for fights such as this.